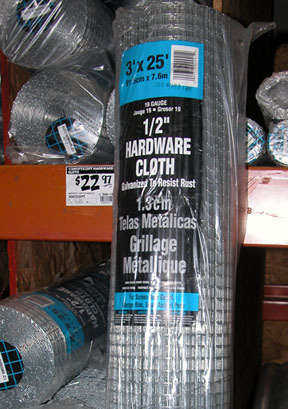 To make your chain link fence higher, purchase a roll of mesh fencing material, also called hardware cloth. It is available at home improvement stores such as Home Depot, and at hardware and farm supply stores. Mesh cloth comes in different strengths. 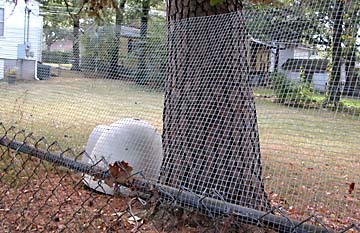 Some mesh is very thin and easy to bend (like chicken wire) and some is quite thick and sturdy. Select some that is strong enough to stay upright at the top of your fence but light enough for you to bend it into place. The roll of mesh on the left is stronger than the green roll. Also pictured below is a T-post. Roll out the fencing and attach it to the top of your chain link fence. You can attach it with lengths of pre-cut wire ties or pieces of baling wire. Baling wire comes in a roll and you can snip it to the desired length. Below you can see the mesh fencing attached to the top of the chain link fence. The mesh is strong enough to stand upright on it's own. 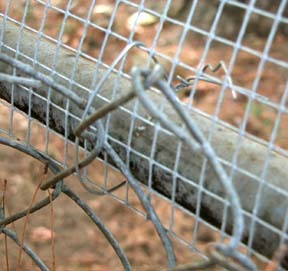 The following photograph shows the mesh wire connected to the chain link fence with a wire tie. The tie was just threaded through the mesh, around the pole at the top of the fence, and twisted shut. This project took just a few hours and it WORKED! The owner had a dog who continually jumped the fence. After extending the height of her fence, the dog was no longer able to escape. A success! If you are unable to attach wire directly to the top of your fence, you can install tall T-posts every 6 feet or so along the fence. You can then attach the mesh to the tops of the T-posts. You can hammer the T-posts into the ground with a sledgehammer.